Looking for information about your family? Check out our outstanding collection of family histories in the Zeeland Museum's research room. The items listed under "NOTES" are only samples of what might be found in our collection. Note: This index includes, but is not limited to, the family files listed below. We will be adding more information periodically, so visit us often. 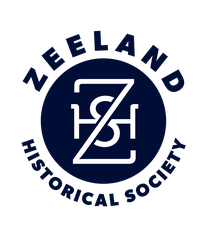 The Family Histories listed below are located at the Zeeland Museum. Copy of handwritten letter to Zeeland Historical Society concerning her husband’s (Dr. Gerald Bosch) military uniform. Dekker Randall 1922-2003 Family history (in Dutch), article copies, obit. DePutter Cornelius 1848-1878 Receipts, letters (in Dutch) with translated transcriptions, copies of photos. Jonkheer/ Yonkers Johannes 1830-1873 Family list, Passenger list "Kroonprinz von Hanover"
Keppel Huibert, Govert Genealogy, family stories, translated; family history books - The Zeeland Keppels (C. VerHage), Derk Kepper and Keppel Family History (incl. letters, translated), 24 volume set and 6 binders in reference section. Copy of hand written letter to Miss Minnie Wilkerdink, 2 ribbon book marks that go with letter. VerHage Cecelia 1860- Booklet - "Dear Pen Pals", birth certificate, stock certificate, newspaper article copies, anecdotes, see also VanZoren booklet - "From Vriesland to Zeeland". Verhage Dirk 1700-1988 Family genealogy (in Dutch) marriage announcement, newspaper copy, booklet - "Recollections by the VerHafe Sisters"
VerPlank Joos 1844-1921 Booklet - "Autobiography of Joos VerPlank"
Weersing Hilligje 1749-1961 Booklet - "Genealogy of the Weersing Family and Janssen Family of East Holland, MI"